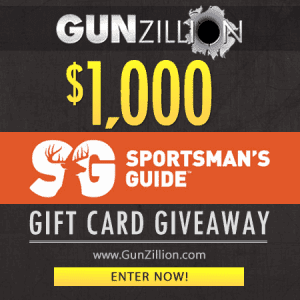 Omaha, NE, December 8, 2014 – GunZillion.com, the largest comparison shopping engine dedicated to firearms, parts, ammunition, and accessories, has partnered with Sportsman’s Guide on a 30 day giveaway promotion. The Grand Prize winner will receive a $1,000 Sportsman’s Guide gift card. Additional daily prizes will include GunZillion t-shirts, koozies, stickers, and Sportsman’s Guide hats and stickers. To enter the contest and see additional details, please visit www.gunzillion.com/giveaway. “We’re thrilled to team up with an industry leader such as Sportsman’s Guide for this promotion,“ said Jacob Messerly, President of GunZillion. “We’ve already received tremendous support from this amazing industry since launching early last month. We’re striving to give consumers the best engine to quickly find and compare products across the top retailers in the firearm industry. We’re an innovative group with some exciting ideas that we’re looking forward to introducing to our customers in 2015”. GunZillion offers hundreds of thousands of products available from a network of the top firearm retailers in the industry enabling consumers to quickly find and compare the products they’re seeking to purchase. Focused exclusively on the firearm market and developed by a passionate group of internet marketers and firearm enthusiasts, GunZillion is able to offer advanced search capabilities and features, offering users a truly world class shopping experience.